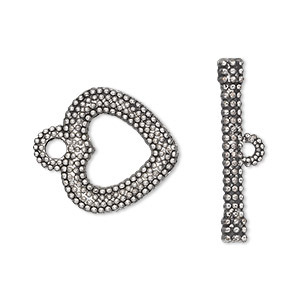 Clasp, toggle, antique silver-plated "pewter" (zinc-based alloy), 16x16mm double-sided beaded heart. Sold per pkg of 20. Item Number: H20-9029FY Have a question about this item? 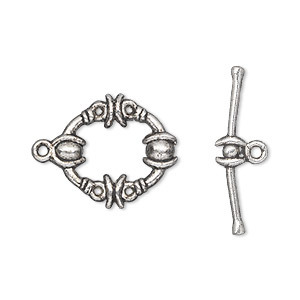 Antique silver-plated toggle clasp in "pewter" (zinc-based alloy) works great as the focal of a necklace or the perfect way to complete a themed design. 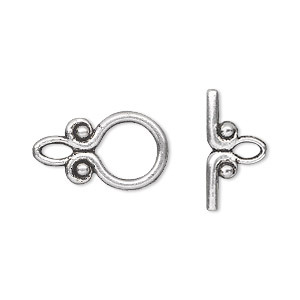 Clasp, toggle, antique silver-plated "pewter" (zinc-based alloy), 16x16mm double-sided beaded heart. Sold per pkg of 500. 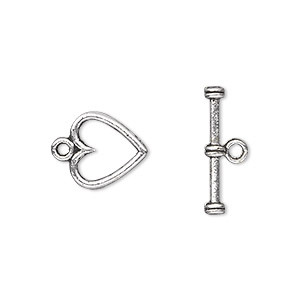 Clasp, toggle, antique silver-plated "pewter" (zinc-based alloy), 19x17mm double-sided beaded heart. Sold per pkg of 10. 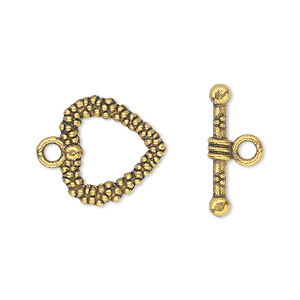 Clasp, toggle, antique gold-finished "pewter" (zinc-based alloy), 16x16mm double-sided beaded heart. Sold per pkg of 20. Clasp, toggle, antique copper-plated "pewter" (zinc-based alloy), 16x16mm double-sided beaded heart. Sold per pkg of 20. 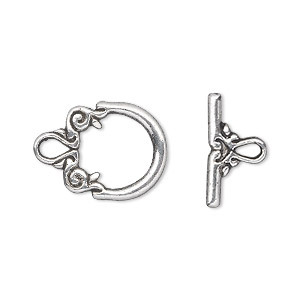 Clasp, toggle, antique silver-plated "pewter" (zinc-based alloy), 19x17mm double-sided oval. Sold per pkg of 20. 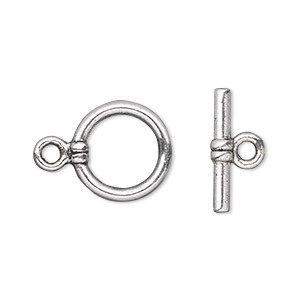 Clasp, toggle, antique silver-plated "pewter" (zinc-based alloy), 15mm double-sided round. Sold per pkg of 20. Clasp, toggle, antique silver-plated "pewter" (zinc-based alloy), 15x12mm double-sided fancy round. Sold per pkg of 20.